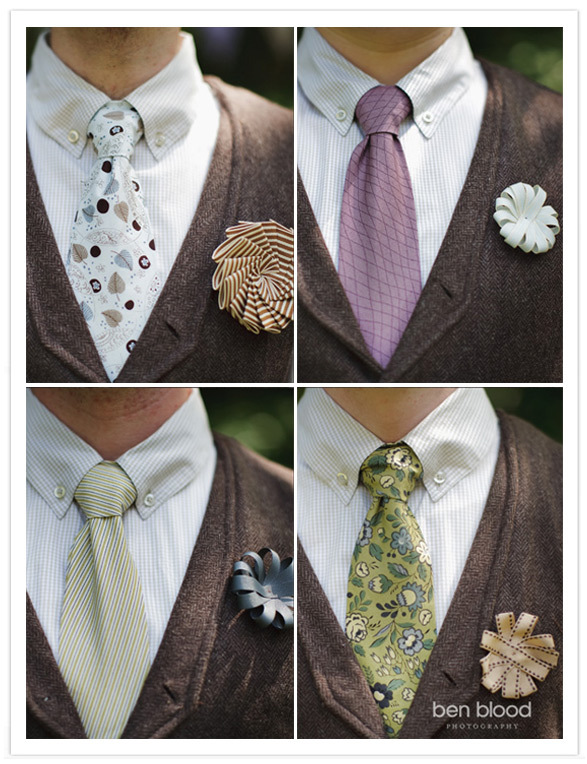 I didn’t purchase the fabric for the ties from Purl Soho. I found a better deal at Hart’s Fabric. Each tie needed 3/4 of a yard of fabric, so I ordered 4 yards to be safe. After I placed the order, Hart’s called to say they only had a little over 2 and 3/4 yards of the Kaffe Fasset Moss fabric. I asked if they could give me a discount since it wasn’t a full yard; they did. I then proceeded to freak out for a good 6 weeks about not having enough fabric. I carefully (and a bit creatively) cut all three ties and the bowtie on the bias from that 2.88 yards of fabric. So imagine my surprise when I had a TON of fabric left. 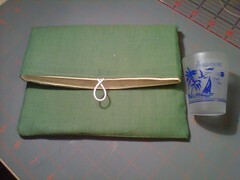 Because I felt guilty for the additional cost of the now extraneous fabric, I proceeded to whip up a few goodies. 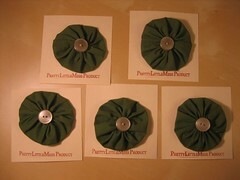 First up were the fabric yo-yos for the gentleman of the wedding to wear in lieu of fresh floral boutonnieres. I had to convince the groom that this wasn’t too frilly or feminine. It’s quite a popular look on the more “rustic” weddings featured on wedding blogs. 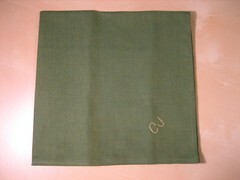 Lastly, the men in the bridal party each received a handkerchief. 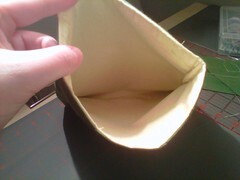 I just took a simple 14 inch square and hemmed the sides. I embroidered their initials. 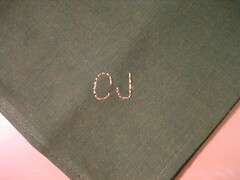 One groomsman’s initials were “SS”, and he chose to hang his hankie outside his back pants’ pocket. If you didn’t know those were his initials, it was awkward. 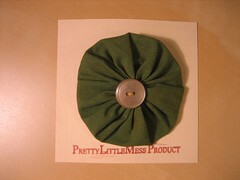 The ladies each received a small pouch purse based on the pattern in Amy Karol’s Bend-the-Rules Sewing. 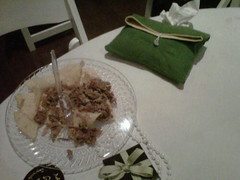 The bride used her purse on the wedding day to keep her diabetic testing supplies. 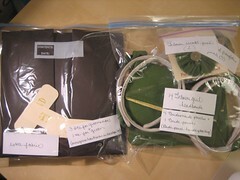 I sent the remaining bits of fabric and all the items in labeled bags. The ties were each packaged with their coordinating handkerchief in a brown envelope with gift tag, ready to be passed out. 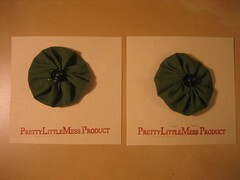 I waited until close to the last minute to send the package as I was still creating things. It cost me $35 to 2-day FedEx this all to Chad in Texas. I hope they thought it was worth it!